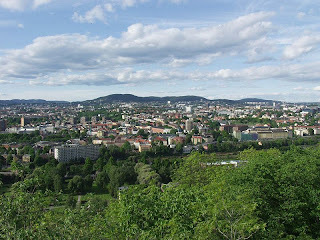 View from Ekeberg toward Grefsen, in Oslo. A week or so ago I wrote a fairly detailed post on why Persian / Farsi is actually much easier to learn than you think, in that it has a much simpler grammar than languages most people learn in school, and only the writing system gives the impression that it's somehow about as difficult as Arabic, which is more difficult for the average speaker than Persian by leaps and bounds. Persian is easy in terms of grammar, most Western European languages have the advantage of common vocabulary and recognition. Norwegian happens to have both of these, and in this post I'm going to show why Norwegian is the easiest language for your average English speaker to learn. Two notes before I begin: It's true that creole languages like Tok Pisin and Bislama are probably easier, but I've excluded them because not only are they still undergoing some changes as they switch from a language used by the majority as a second tongue to one used by more as a first tongue, and also (no disrespect to them, I think they're great as languages) because they are really only useful in a very limited part of the world. The Bislama Wikipedia for example at present has only a total of 112 pages, and I made a few of those. For similar reasons I'm going to rule Scots out as well, in addition to the fact that there's still a debate as to whether it's a language or a dialect. In my opinion a language is an independent language if 1) There are grammatical rules of right and wrong (i.e. you can't just make it up as you go along), and 2) It's not immediately understandable to users of the most related language (i.e. English). That's a different subject, however. Secondly, I'm also obviously excluding constructed languages: Ido, Occidental, Lingua Franca Nova, Esperanto, Interlingua, Novial, all those. They were made to be easy to learn which obviously skews things in their favour. Now, to Norwegian. First a short introduction. Norwegian (here I'm talking about bokmål, the most often-used variety of Norwegian) is a language spoken by about 5 million people in Norway, and is extremely similar to the languages Swedish and Danish. Its written form is more similar to Danish, but in pronunciation it's more similar to Swedish than Danish. From the Norwegian I've studied as well I have an easier time reading Danish but can't understand it at all, and Swedish is easier to listen to. The three languages are so similar that they are often regarded as a dialect continuum, that is, if there happened to be a single country in place of the three we have today there would probably only exist regional dialects, not thought of as languages. The total population of these languages is about 20 million. Swedish is also an official language in Finland, though certainly not used by the majority. Lastly, Icelandic is also related to these three, but far more distantly, and it has a much more complex grammar, being more conservative in that it has maintained much the same form over the past nine centuries or so. That's why Icelandic people can still read the old Norse sagas. See the page linguistic purism in Iceland for more information on how this works. Luckily Norwegian does help in understanding Icelandic, certainly more than other languages you could choose to learn (except Faroese, but that's only spoken by 70,000 or so), so Norwegian is a good language to start from if you have a personal interest in them. 1) Norwegian is a Germanic language. Wikipedia er en encyklopedi på over 200 språk, som skrives av frivillige bidragsytere fra hele verden. 2) Norwegian has a much easier grammar than other Germanic languages. Edit: People have been pointing out that Dutch does use the verb argumenteren. I'll leave the below as is though because it's merely to show how conjugation works. Deniga frēan, • cūðe hē duguðe þēaw. in front of his king: he knew the courtesies. English doesn't look like that anymore though, so the ge- prefix is now foreign to the English student of Dutch and German. 3) Norwegian word order is different from other Germanic languages, and much closer to English. English "I can speak German" becomes "Jeg kan snakke tysk" in Norwegian, with the same word order as English. In German however, this is "Ich kann Deutsch sprechen", or "I can German speak". English "I haven't eaten today" becomes "Jeg har ikke spist i dag" in Norwegian (ikke = not, i dag = today), with the same word order as English. In German this is "Ich habe heute nicht gegessen. ", or "I have today not eaten". Russische Truppen sind in Südossetien eingerückt, um die georgische Offensive zur Eroberung der Hauptstadt Zchinwali zu stoppen. "Russian troops are enlisted in South Ossetia to stop the Georgian offensive to capture the capital Tskhinvali", but the word order here has now become quite different, literally "Russian troops are in South Ossetia enlisted, for the Georgian offensive to recapture the capital Tskhinvali to stop". Samtidig fortsatte Russland å benekte at deres hensikt var å okkupere Georgia. "At the same time Russia continued to deny that their intention was to occupy Georgia." The one difference here is that it begins with "At the same time continued Russia..." with the verb switched to the front. Norwegian word order is slightly different from English, but it's that much closer that the student of Norwegian will be able to get by most of the time without having to think about word order all the time. There's another language that I haven't yet mentioned here, and that's Afrikaans. Afrikaans is another language that is often claimed to be the easiest language for an English speaker to learn, and having spent some time with it (because I like it quite a bit) I can ascertain that it really is easy. I still have to give the edge to Norwegian though, for a few reasons. First of all a short introduction to Afrikaans: Afrikaans used to be Dutch, but changed into a language of its own after a lot of isolation and other influences, and is sometimes referred to as a half-creole in the way it simplified so much over a short period of time (kind of like the difference between Old English and Medieval English). It's easier to learn than Dutch because it has no verb conjugation by person, grammatical gender is gone (like in English), the writing system is easier ('my' for me or my and is pronounced like English my, but it's written mij in Dutch), etc. Afrikaans doesn't express the perfect and pluperfect (I had done, she has gone, they have seen, we have drank, etc.) like in other Germanic languages. That means that Ek het gebreek meaning "I broke", could also be translated in English as "I have broken" or "I had broken." This actually makes it an easier language to learn for a lot of non-English speakers, but for those that are used to using it it's easier to express oneself in a language that has it, and if it's easily learned and used (like in Norwegian) then it's easier on the student if it has it. In Norwegian it's jeg brekker, jeg har brekt brukket, jeg hadde brekt brukket. Norwegian has the edge on this one. Norwegian has two genders. Technically it has three, but the male and female are grouped into the 'common' gender, and it's not really necessary to learn anything but the two (common and neuter). My dictionary for example doesn't even list nouns as anything but those two. Luckily the majority of words are of the common gender, meaning the student only has to keep an eye out for neuter gender words. Not too difficult, but since Afrikaans doesn't have gender in the first place it has the edge here. Plurals. Norwegian plurals are very regular. Add an -r to the end if it ends in a vowel, add an -er if it ends in a consonant. Problem becomes problemer. Bilde (picture) becomes bilder. Only a very few are irregular here. Afrikaans generally uses an -e, so land becomes lande (lands). Sometimes though it'll use an -s, so artikel becomes artikels. Afrikaans also has a few irregular plurals. Remembering to look out for words with an -s plural is at the same difficulty as remembering to look out for neuter gender nouns in Norwegian, so this point and the one above cancel each other out. Word order. Afrikaans also has much the same word order as Dutch and German, so Norwegian is closer to English here. Pronunciation. They both are quite easy except for the Afrikaans g, which is that guttural sound you hear in the Scottish loch. It's certainly not impossible but the Afrikaans g is a bit unnerving to the English speaker when you get a few of them in quick succession: From Google you can see an example (ek added by me) Ek het gister terug gegaan London toe, which means I went back to London yesterday, but the part in the middle is pronounced like khister terukh khekhaan, which is a bit hard to get used to. It's a small point though. Adjectives. Like in other Germanic (and other Indo-European) languages adjectives change a bit before a noun. Norwegian and Afrikaans are about the same here. Verbs. Norwegian has strong verbs, meaning that they are irregular in conjugation, like English sing/sung (not singed), fly/flew (not flied). A lot of these verbs are irregular in the same way English is though, meaning that you will see verbs like se (see) becoming så in the past tense (å sounds similar to English 'aw'), drikke (drink) becomes drakk (drank) in the past tense, gi (give) becomes gav (gave). They're not all like that, but enough that it makes learning them kind of fun, and the others are generally very easy to learn (bli for become for example becomes ble, nice and short). Here's a list of some common Norwegian verbs if you want to take a look yourself. Finally, this has nothing to do with the language itself, but with the countries they are used in. Afrikaans is used primarily in South Africa and Namibia, in South Africa it's one of 11 official languages, and English is an official language there too (and in Namibia as well). That makes it that much harder for the student of Afrikaans to use it even within the country. Norwegians are generally quite good at English as well, but it's not an official language there and since Norwegian is the only official language in Norway at least you know that once you step off the plane at the airport everyone around you is going to be using the language. Norwegian also has a stronger online presence (Wikipedia for example and the volume of news in Norwegian is actually quite large), and the majority of English speakers (United States, England, and English-speaking Canada put together) are geographically closer to Norway. understand 69% of the written swedish language. In short, Norwegians have the easiest time understanding other Scandinavian languages and speakers of other Scandinavian languages have the easiest time understanding Norwegian. You'll notice that Swedes have a very hard time understanding spoken Danish. "Norwegian is Danish spoken in Swedish"
Forming the passive is simply wonderful. You do it by adding an -s to the verb. Done! Here's an example from Wikipedia: Wikipedia er en encyklopedi som skrives... this means "Wikipedia is an encyclopedia which is written... if you had written som skriver instead it would mean "an encyclopedia which writes". Since it's a Germanic language that means you will have a fun time realizing that words that originally don't seem similar to English actually are. One example is the word selvstendighet. Looks like a completely foreign word at first, but each part has an equivalent English word: rewrite it as self-standy-hood and suddenly it looks more familiar. It means independence, which is a state of being able to stand by oneself. Another example is snikskytter. That means assassin, or a 'sneakshooter'. Norwegian is full of these words. It also has words that aren't exact English equivalents, but are similar. I've always thought that a lot of Norwegian words seem like those words you will sometimes wake up with in your head from a dream that seem so real in the dream but then turn out to be words that don't actually exist. A translator for example is an oversetter, to exaggerate is overdrive, to accept is godta (goodtake), abroad (as in another country) is utland, and so on. The genetive is easy, as you just add an s like in English. English "flag of India" becomes Indias flagg. If you know any Scottish English or Scots, you'll notice some similarities there too. Child is barn (a wee bairn), good is bra (Oor Wullie: "Och aye, that wis a braw meal! "), know is kjenne (I dinna ken that), and more. Not related to the language itself, but as of 2008 Google now offers automatic translation into and out of Norwegian. Automatic translation is very good as a language learning tool and can often help you out when stuck with a word or phrasing that you just can't figure out. Though not a complete overview, hopefully this should serve to show why Norwegian is the easiest language for an English speaker to learn, assuming a completely unilingual speaker that has no particular connection to any other country and is looking at foreign languages for the first time. I'll finish up with a few links to help anyone get started that is interested in learning the language. And (this is probably the best link after learning the basics) Klartale.no has news in simple Norwegian, and a podcast of slow spoken Norwegian as well. Any other good links? I'm sure there are many more out there, so leave comments below and if I think it belongs in the list (none of those multilingual dictionary or language exchange sites that focus on too many languages at once please) then I'll add it. Thanks for the research and the insight you give to us. Thanks to you, I am going to learn Norvegian. I feared that would be too hard and there would me too many differences with French/English. Fantastic job! I'm a native English speaker, somewhat native Spanish speaker, and have learned German and Hebrew. This kind of comparison and placement of language in relation to it's neighbors is so useful! I had just begun to learn Norwegian but worried back and forth whether Swedish was the better route. I'm convinced Norwegian is the way to go now! I would just like to point out that Dutch DOES have the verb 'argumenteren'. Another advantage that Norwegian has over Danish is that it's phonologically written. Danish has many more complexities of pronunciation that are not reflected in the writing system, and it has a system of glottal stops that are hard to pick up. For example, the only difference in pronunciation between "bønder" (farmers) and "bønner" (beans) is that "bønder" has a glottal stop on the "ø". Also, Danish has lots of silent letters, especially the letter D.
Finally, Danish preserves more of the spelling of foreign words. French -tion words such as "information" are spelled with the -tion ending in Danish, while the Norwegians use the phonologically appropriate -sjon. So DK "information" is "informasjon" in Bokmål. As a native English and fluent German speaker I can confirm that Norwegian really is incredibly easy to learn. Of course I've forgotten most of it because I went on and learned Icelandic since I'm more often in Reykjavík than in Bergen, Oslo or Trondheim. You say that swedish is easy to learn? I seriously doubt that, I know immigrants who've lived here for 10 years who doesn't get it right. For example, can you tell me why you say "Ett hus" (a house) instead of "En hus"? I've been living here for all my life and I still don't know why, just that the other one sounds "right" and the other one doesn't. I would still argue that Dutch is easier to learn for English speakers. I believe you're undervaluing the importance of the cognates. Learning the slightly more complex conjugations of Dutch and the inverted sentence structure (which can be substituted with a more English-y sentence structure in many cases) is fairly straightforward, and once one knows the rules, that's that. But with Norwegian, one must learn the simpler Norwegian rules and many, many more completely new words. Vocabulary acquisition is a much longer process than getting the hang of the grammar of a language. You said: "Norwegian (here I'm talking about bokmål, the most often-used variety of Norwegian) is a language spoken by about 5 million people in Norway,"
Actually, no one speaks neighter bokmål nor nynorsk in Norway. They are both written languages, and are only spoken on NRK, the national broadcasting company which is required to have a certain balance between bokmål and nynorsk. A lot of the speakers of dialects in south eastern Norway think they speak bokmål, while they actually use grammar and word forms more close to nynorsk. I think you got a little unlucky there and that you were not meaning to imply that all 5 (or 4.8) million norwegians were speaking bokmål. It would also be interesting to know if you have any opinions on the difficulties of learning nynorsk as opposed to learning bokmål for english speakers. Other than the blatant disregard for norwegian language history and the misunderstanding that we all speak bokmål - great post. "Norwegian is the only official language in Norway"
I think the Sami languages are official as well, but only in their traditional regions. A very fine article indeed, however I must add that what makes Dutch easier to learn than Norwegian is its tone structure, which is very similar to that of English. The tone structure of Norwegian is very complex, and might take years for an English speaker to mimic accurately. I'm a Norwegian-American living in Norway, and I guess I never thought of it this way. I'm not familiar with all other languages in the world, so to say that Norwegian is the easiest for English-speaking people to learn, I could not confirm. However, many good points brought up in this post. With that said, you can easily tell apart those who know the language well, and those who are "faking" it. It takes quite a bit of time to learn when to use different type of endings, or just the Norwegian version of "a". Takes a while before you "get it" on how to use the language, but it is very similar to how English is structured. Just takes a bit of getting used to, since most of the time, the sentences are structured a bit differently than English. I know, because I sometimes structure Norwegian sentences in the way that English is structured, which makes it sound kind of odd. You left out an important fact: Swedes are fascists! You are right in that Norwegian is easy to learn to read and write and for English speakers, but it's not that easy to learn to speak and listen to. Norwegian is a pitch accent language and a tonal language with a great dialetical variety of tonality. For that reason it uses diacritics, in writing, which are not used in English. As a former instructor of German, the problem that English speakers of German have is not so much the word order, but the gender/case system. I'd love to see a follow up to this article, examining the case system, if it exists in Norwegian. Having worked in Denmark and Norway for slightly over 3 months each, and being fluent in English, Spanish and Portuguese, I totally agree with your post. Norwegian is pretty easy to read once you get the hang of it and familiarize yourself with the words, even if you know little more than basic English. I was much more at home in understanding Norwegian than Danish (although being in Denmark first probably helped). Also, from an English speaker standpoint, Norwegian compared to Danish is pronounced a lot more like how it's written. As for Icelandic, it's much closer to Danish, but quite harder to read, specially due to their extra characters. Good luck, and thanks for a great article. This reminds me of a very serious yet unintentionally funny scene in Breaker Morant, where Morant (I think) is interrogating a Boer prisoner, using an interpreter. MORANT: Ask him what his name is. INTERPRETER: Wat is je naam? Oh man, it was like something out of Monty Python... I guess you had to be there. Also, for most Americans, German is easiest to learn, because it's the one they can actually learn at school. If you know English and German, it seems to me that Dutch, Norwegian, Frisian, Flemish, Swedish, Danish, Afrikaans, and Icelandic would all be orders of magnitude easier to learn. It is nuts to say any language is "easy." There are thousands of nouns to memorize, which is bupkes compared to verbs, conjugation, idioms, etc. You might learn to order a beer the first day studying Norwegian, but it will be a HUGE effort to converse fluently. I lived in Denmark a few years and the Danes said Norwegian was the same as speaking Danish, but with a hot potato in your mouth. I do know learning any foreign language, particuarlarly as an adult, is very, very hard and saying some languages are "easy" is absurd. Good job 'anonymous' (post above)! Way to confuse 'easy' with 'easiest'. Maybe you should learn to understand English before you criticize someone who clearly knows A LOT about languages....With that said (and off my chest! ): Excellent post. Coincidentally enough I just met a beautiful Norwegian girl at DefCon and the pointer to Google's translator (had forgotten about that, sorta) and the native Norwegian translation will allow me to send her emails in her native tongue, which should tickle her pink! et min drit - same word order indeed! Anonymous was not confused. Here are relevant quotes which used "easy" and not "easier" or "easiest". "why Norwegian is so easy to learn"
"Other aspects that make Norwegian easy to learn"
Afrikaans "really is easy. I still have to give the edge to Norwegian though, for a few reasons." (Meaning that Norwegian is easier than something which really is easy => Norwegian is easy. Jag lär mig svenska nu som vuxen och jag kann säga att ibland är det enkelt, men det har varit svårt att komma till nivån där jag kan flyttande svenska. Det är precis som anonymous sade. People, people. It's all very nice, but when you have nothing to say in your native language, what exactly are you going to have to say in another? Just look for the English section for the Swedish CFL course. Afrikaans is your mother tongue, of course that is the language that you find most descriptive. A language to be considered as simple and easy to learn does not take anything away from the language since it is a language. Every natural language in the world have the same power no matter how simple they seem to be grammatically or otherwise. I'm an American who has been living in Norway for 10 years, and I can say that while the author is correct about many points, there are a lot of complicating factors he ignores. For example, Norwegian is tonal, and has a range of vowels that are quite unlike anything in English. Further, every region has its own dialect-- even native-born Norwegians have trouble understanding some of them. Finally, Norwegian has two written forms, so there are two dictionaries and two sets of grammar rules. Scandinavian languages, apart from Icelandic, have not much in the way of case systems to worry about. Pronouns have cases, but not nouns. Cognates are good, but also means lots of "false friends". For example "argumentere" only means "argue" in an abstract academical sense (google it and you will get hits from philosophy departments), not in for example the sense "we argue a lot". The bokmål/nynorsk situation is a mess. Spoken Danish is by no means horrible. It's just difficult. It's probably Scandinavia's most beautiful language, actually. Being Swedish with family in Norway and living next to Denmark Interesting article! I would say Norweigan is relatively easy to understand, more so than Danish. Listening to Danish is like listening to either a drunk Swedish or someone with a potato in their mouth, or both. However, I do need to concentrate to understand both Danish and Norweigan, more so with the former. To understand the written Danish and Norweigan is easy for me. and so on, being an irregular verb. Bokmål as written language is used by the vast majority of Norwegians. Nynorsk is a constructed writter version of Norwegian constructed by listening to some western dialects less influenced valleys to distinguish from our Danish heritage (and rule) in the late 1800s. Ivar Aasen was the designer of Nynorsk, even though it has been adjuested since then. Bokmål is used by more than 95% of the population as primary written language and Nynorsk has much different style and also some other rules. As such it is not very popular counter to the beliefs of its followers. Bokmål is very close to eastern Norwegian spoken language as well as Bergen urban language. Norwegian for the purpose of learning is best done using Bokmål as template. This given it is not designed to be different for the sake of being different. When he says 'easy' in the article, I think he means easy to learn, not that it's like going for a walk in the park. Languages that are easy to learn still take time, but don't give you a headache like some others can when you just can't get your mind around how it works. Lexin — “dictionary for immigrants.” I think this is a good resource for people who doesn't know norwegian too well, but are fluent in english. Norwegian - norwegian dictionary, a good resource if you already know some norwegian, but are uncertain about some words, their gender, or their conjugation. I love your article! I'm really interested to read what you think about Frisian - it's also similar to English in many ways. Ah good, I always thought this Danish thing could be much harder - thanks for backing me up! As my countryman Geir pointed out, "å brekke" is indeed an irregular verb, and is thus conjugated "brekke - brakk - brukket" (mostly pronounced "brokket"). Secondly, I would like to mention that we have a broad variety of dialects, what with all our desolate fjords and all, and some of them might be hard to understand even to a native norwegian (the dialects, not the fjords...), if not accustomed to them. I am equipped with such a dialect, so I should know. I guess this is no different from most other countries, though, and bokmål will take you a long way. Thanks to both of you for the correction on brukket. >I am equipped with such a dialect, >so I should know. I guess this is >no different from most other >countries, though, and bokmål will >take you a long way. Yes, the only exceptions to this I think are languages like Indonesian that have different regional standards as a result of having a completely different mother tongue, so it's on a different level than mere dialects. I'm an American, have studied Norwegian for three years now and have been living in Norway (Bergen) about a year. The article makes some good points, but is also a bit simplistic in its claims. Namely, that a language is simple to learn if the grammar and vocabulary are similar to one's own native tongue. That's true to an extent, but there are also other mitigating factors in the case of Norwegian. First, the fact that most Norwegians know a fair amount of English themselves is actually quite a drawback. The temptation to switch to English is simply too great if you're not able to make yourself understood in Norwegian. That's a problem, if your goal is to become really good in Norwegian. Second, the author barely mentions the prevalence of different dialects in Norway. As a foreigner, you're most likely to be taught Oslo-Norwegian. If you want to go somewhere else in Norway then you have to become used to an entirely new dialect. My experience with the Bergen dialect has not been a pleasant one, to say the least--it sounds like a completely different language! And I've found that most Norwegians are not willing to "neutralize" their dialects for my sake--they'd sooner switch to English than do that. Also, there aren't as many resources for helping one learn Norwegian, simply because Norwegian isn't a widely spoken tongue. There's no "501 Norwegian Verbs" book that I'm aware of, as there is for German, French, Spanish, etc. I met a Norwegian girl a few months back and became interested in learning the language but havent done so yet. Just a few phrases that my friend taught me. Someone earlier mentioned about vowel sounds. For me they were a bit easier as I found a lot of them were similar to Irish (Gaelic) sounds, just have to remember which one is which! Maybe I have a slight advantage. It certainly looks a lot easier than Irish which is quite different to Germanic languages in terms of structure and use of unusual letter combinations (compared to French etc) that are rarely seen in other languages (as far as I know) for example "bh" is pronounced as a V.
All I know is Norwegian girls are HOT so its worth learning the language! When I had finished reading your article for a moment I was tempted to give Norwegian a closer look. Nicely written! However, the comments to the article made a number of additions and corrections that made me quickly shirk away from the challenge of yet another language. But why would you learn Norwegian? But without kidding, I would like to see a poll about this. I am not convinced. There have been mentioned a lot of good con's that have not been incorporated in your story. In the NY Times today, there is an article with a picture of a genetic map of Europe. Looking at it, the British/Irish seem to be most closely related to the Dutch/Norwegians/Danes. Shouldn't their languages logically mirror that? I am learning Danish myself and I find reading Norwegian is a piece of cake, and learning it must be the same too since they're pretty much pronouncing things as they are written, unlike Danish. Now I wish I had landed in Norway. I am South African, speak Afrikaans, English, German and studied Danish. Isn't landsmål(nynorsk) also an official language? By the way, NE English dialects, as well as Scottish, can help with vocabulary in Scandinavian - e.g. Geordie hyem = Danish hjem, Yorkshire dale = Danish dal... whereas reading Dutch with a Scottish accent often makes sense of what looks intractable. Did you know that I had two friends refer me to this article in a single day? Not bad. :) I've long been saying this but have had nothing to support my arguments before now. Tones are hard. However, I've never had anyone not understand me because I'm completely ignorant of the tones in Norwegian. (Which I am... I'm only just starting to hear them, so I don't try to do them yet :P) Yes, it makes me sound non-native, but pronunciation is always hard for me. I still think Norwegian is easier than most others here. - If you find Romantic language genders to be easier to remember than those of Germanic languages because the word ending often gives it away, you can cheat and use the same method in Norwegian. Just learn the definite for of the word, where the article attaches to the end. Jeg is pronounced Æ in some dialects, which in a sentence sounds just like I. Sometimes there will be an entire sentence that sounds enough like English for someone who knows NO NORWEGIAN to understand, for example Æ kan se! For Eksempel: "Kan du høre meg nå?" That's a good piece of advice about putting the article on the end to remember the gender. Boken, landet, krigen, etc. It would be nice to see a dictionary that lists them like that with the article in bold, because otherwise you wouldn't know whether the word ends in a consonant or a vowel. I lived in Norway for nearly ten months and by the end I could read a reasonable amount (the subtitles on TV helped!) but could barely speak a word. The problem I found is that at the first sign of you faltering in Norwegian most people would switch over to perfect English. It was only in out of the way places (Tromso especially) that I had no choice. As a generally intelligent guy with an interest in languages, but with no training other than some high-school Spanish, would the easiest thing be those Living Language tapes at the library? Are those Rosetta Stone courses quality or a scam? Is there a particular book/CD package you would recommend for its quality, accuracy, and efficiency? Every Norwegian younger than 45 years or so have learnt a lot the opposite way by reading subtitles to English language programming. There are some rather good norwegian Movies like Elling, that have versions with English subtitles. That being said Rosetta Stone programs most likely provide the most efficient but maybe not easiest way to learn Norwegian. I german friend learned Norwegian in 10 years pretty much on her own by digesting some of my Donald Duck & Co comics when she felt like it. This sounds like quite compelling wau to learn, along with Subtitled movies. Yes, English is the second language to all Norwegian and some of us speak it far to well for it to force you English native speakers to learn it fast. Still if you insist, I am sure most Norwegians would be more than happy to stay talking Norwegian in support of your efforts - if told so. But remember Norwegian is not a world language - it has not been since the year 1100 or so, still then it was Norse rather than Norwegian. It depends entirely on how you study as an individual, but I often think the best way to learn a language as similar to English as Norwegian is to first buy a textbook (Colloquial Norwegian or Easy Norwegian for example) and a dictionary, then spend about two months or so going over the grammar until you have a good idea of how the language works. You'll also be able to read quite a bit by yourself, and after that it's best to go to something you're individually interested in, but in Norwegian. If you like Roman history for example, print out all the articles on it from the Norwegian Wikipedia and go over the articles sentence by sentence as you learn new words and get used to how it differs from English, like where it'll use 'over' in a place where English might use 'for', the difference between i and på, etc. Listen to Klar Tale and NRK podcasts at the same time, and eventually you'll probably get a strong desire to actually visit the country and put some of this to good use. After that I guess it's up to you. The word "Snikskytter" is closer to sniper than to assassin. Assassin would be "Leiemorder" ("Hire-murderer"). Nice article. You managed to describe in a structured way what I also experienced in some way. I am a native German speaker and fluent in English. I spent my last year in Stockholm and studied Swedish there but also got to know some Norwegian due to a couple of Norwegian friends. It is true that Swedish or Norwegian are really not very difficult to learn. But as some other people wrote in the comments, it could be hard to actually speak either of these languages. When I arrived in Stockholm I hardly knew any Swedish, so I talked to everyone in English. This was fine, but when I felt that I knew enough Swedish now to really talk Swedish to my Swedish friends it was difficult to switch to Swedish, because we were all so used to talking in English and of course it was more comfortable for me because English was a foreign language for me and for them, so we were on an equal level. But sometimes I went to events where I knew that I won't meet many non-swedes just to practise my Swedish. Anyway, I learnt a lot by listening to Swedish news, read Swedish articles and stuff like that. I also always tried to figure out what all the Swedes in the busses, the trains and on the streets were talking. If you want to, you could learn Swedish (or Norwegian) quite fast - not perfect, but good enough to be able to talk to people and improve the language skills by mere usage. Speaking Norwegian is easy. Masteringit perfectly is a challenge. Infact up until the Schengen Agreement took effect, Norwegians never had to use a passport getting into Norway. You just had to say "Norwegian from London" for example. Norsk fra London...(in local lingo) And that was sufficient to separate the natives from the rest. I always heard that Frisian was the European language closest to English, which I would assume would make it the easiest to learn. Granted, Frisian isn't one the the major languages of Europe, but I would be interested in a follow-up on this. Frisian is really similar to older forms of English but over time has taken on a lot of Dutch influences, so now it's not immediately recognizable to an English speaker like it used to be. It also has verb conjugation by person which Norwegian doesn't have. It's a bit easier than Dutch but it seems to be really hard to find anywhere to use it which isn't as much a problem with Scandinavian languages. If you have enough motivation and/or are able to find just the right environment to learn it then it is quite easy. I think I'll write a small post in some more detail in a bit. You could always argue that English is the closest language to English. But that would just be silly. Redetwisten = to fight with words. Being a rather oldfashioned word, it is not used anymore since the 50's of the last century. I guess I would say "bekvechten", or "discussieeren" when it is more civilized. Also a bit old fashioned, I would say "debateren"
* a bomstation has nothing to do with terrorists, unless you count the toll collectors as such. * Bil(car) in Norwegian has nothing to do with bil in Dutch (buttock). ... whereas reading Dutch with a Scottish accent often makes sense of what looks intractable. Imagining this made me LOL! you should specify that norwegian is easiest for native speakers of english. not to be discouraging but to be realistic, you should point out the differences between english and norwegian that definitely do exist to give a fuller picture of the situation. there are some aspects of norwegian grammar which will seem alien for a native speaker of english (such as the endings -en, -a, -et, and -ene [and possibly -a], which all mean "the"), the more nuanced vowel system, the tones, and the fact that there is, like english, a number of different ways to pronounce many letters. but your goal to reassure others that language learning does not have to be a daunting task, is appreciated! god jobb! fortsett frem! Very interesting, but I must beg to differ! No Germanic language would be the easiest language for an English speaker to learn. Yes, simple words are very similar in Norweigian and also these words in a Romance language like French are different. But as soon as you try and start talking slightly more eloquently, the words are completely unrecognisable in a Germnic language, even when there's similarities in the small words that make those words. I'm going to use an example of German: ankommen which means arrive (as you know probably). Yes you could learn that meaning by kommen and the prefix which sort of makes the meaning clear, but wouldn't you agree that the French word "arriver" is far easier to learn than that? And, the example you used in the article, well the French word for independence is "indépendance" which is almost exactly the same and far easier to learn than the Norweigian word. English is filled with Latin vocab unlike Norweigian. Therefore, I think that the Romance languages are easier to learn but I do agree that Romance grammar is probably harder than Scandinavian grammar. By the way, English is spoken in the whole of the UK: England, Wales and Scotland, not just England as you implied in the article. English is spoken also in the US and Australia .....I would think. Jeg er norsk - as you can see the word by word translation works the french have a much more complex writing and am/er is closer than the suis. That is really close ...well credits to Babelfish for the translation. After skiing the slopes Norwegians go for After ski - signifying the drinks and partying in ski attire at the local bar... In the UK this is called Apres Ski - the french word .... just to cool of an activity to be said in the native lingo. I'm not sure exactly what you mean but I did use the word 'eloquent' in my initial post. What I meant was that although simple English vocab is similar to Germanic languages like I and ich, make and machen, house and Haus, etc. Any eloquent words, which is the majority of the English vocabulary are completely different in a Germanic language and often exactly the same in French for example. You underestimate the importance of cognates! It's easy to learn grammar rules because they can always be applied in the same way apart from exceptions, but alien vocab is the biggest difficulty normally. That's why Germanic languages are harder for a native English speaker than French because after the norman invasion of England in 1066, the English language absorbed French vocab and so modern English shares 78% of its vocab with French and not German! Most of the words in this post are of Latin origin, it's just the simple words which are Germanic. Thank you for the awesome post, as a speaker of English, Bislama ( I've lived in Vanuatu), French, Spanish, Urdu, Hebrew and Fijian. I could see where you are coming from. I applaud you for giving me a very simple insight into the Norwegian language. I have been really confused at to which Scandinavian language is the easiest. Now that you have confirmed that Norwegian is the easier of the lot. I will try and learn it. Thank you once more. I only wish more people in my family were as curious about languages and cultures as I am. I have a tiny bit of personal experience with understanding Norwegian as a native-English-speaking child...my dad picked up a few phrases of Norwegian, presumably from being a pastor in Minnesota. He would often say to us kids, "Skall vee go no?" (I have no idea how that's spelled in Norwegian, I'm just giving a phonetic spelling.) We knew perfectly well that he meant, "Shall we go now?" and when we said the same to him, and he responded, "Ya, louse go," we knew he meant, "Yes, let's go." For years, I assumed he was just saying the English words in a funny way, and was very surprised to learn he was actually speaking Norwegian. :-) In any case, my university just started offering Norwegian, and I'm really excited to learn it. Thank you so much for posting this! I am really excited about learning another language and I think Norsk will be it! This was useful and great at articulating how an average English-speaker can have an easier time learning this language as opposed to others! I would like to respectfully disagree with your comment that creole languages would be easier. I think that is a huge generalization, especially since creole languages have different superstrate languages (e.g., French, spanish, English). It is my understading that Tok Pisin and Bislama are English creoles, and I only have little knowledge of them so they may indeed be easier to learn than Scandinavian languages. Regarding tense, for example, there are some discrepancies and 'grammatical simplifications' which would take more time getting used to just like the "tense isssue" you bring up in Afrikaans. I would also like to add that in many creole-speaking regions/country, creoles are, and have been spoken by a majority of the populations for decades/centuries as a primary language. After reading the first couple of lines in the article, I asked myself: "Who would want to learn norwegian? It's so boring..". Well, somebody should really make some sort of a website where people with cravings for knowledge about languages could meet. First, they would exchange some information about themselves and what language they would want to learn. Then they could try to meet in real life and help each other out learning the new language. I know I would enjoy meeting somebody that knows french and wanted to learn norwegian.. That would be fun! Of course we would have to have at least something more in common. Daniel-=spelled "skal vi gå nå"
I have spoken English since I was 4 years old..we learn that in kindergarten .. I have been here in Norway for 3 months and I can already speak quite a bit of Norwegian, I am fluent when it comes to day to day conversations but with more technical things I struggle. However, I would not say it is a very easy language to understand when it is spoken. The dialects are a mess here. I live in Oslo and I can only understand the people who live in this city. If you are to drive an hour to the west I would be completely lost. Nobody speaks perfect bokmaal or nynorsk. Many words are pronounced quite differently than they are written because of the situation with dialects. I also agree that it is not fair to say learning any language is "easy". I am 18 and I am an American exchange student. Wow, how many languages do you know? I really enjoyed the article, it is motivating me to learn the language again, and hopefully stick to it. I've been teaching myself several languages since I was 14 - I'm mostly focused on Italian and Norwegian(it's in the my blood), as well as Japanese. I know a bit of each, but once I get stuck with one (usually verbs, and in the case of Japanese, particles), it is hard to not become interested in one of the others and get distracted, so it is a slow pace. After beginning to understand written Japanese(depending on the Kanji I have learned), anything Latin-based looks easier. I would also like to mention learning Norwegian a few years ago was more difficult because there weren't so many online resources. I found some good sites - I still have all the NorWord emails in my inbox; but there was definitely less material, and fewer options. Wow, AWESOME article. You provided an extremely convincing argument. English is my first language as I am from Australia but I am also very competent in French. I am looking for a third language to learn and Norwegian takes the cake! Fantastic article. I've tried to learn Portuguese and German and found German the easier of the two. The Portuguese language has sounds I just can't manage to make! http://fltseng.com/2009/01/norwegian-an-easy-language/ however, I'm very proud that someone took the effort to make the case for the Norwegian language! I just felt like adding another -hardning- factor to spoken norwegian! We have the sk, sj, skj sound. To an untraind ear, they all sound the same, but they have to be pronounced with outmost punctuality, if not you might end up saying something really weird. Wow, what a great article! I wanna learn Norwegian now! I drink, he drinks, I drank, I have drunk, I'm drinking. I'll second about the difficulties with Norwegian pronunciation. I'm English and have been teaching myself Norwegian for nearly three years, but it wasn't until six months ago when I went to Norway for the first time that I realised there was a difference between the Norwegian I and Y, and between O and Å.
I agree that Norwegian is fairly easy for English speakers to learn, but there are a few difficulties that you have overlooked. -Word order can often be very different from English despite the examples you give. For example: "Hvis ikke du vil bli med, bli her" reads literally "If not you want become with, become here" but means "If you do not want to come along, stay here"
to read and write danish only. This is why norwegian words are still similar to danish and also very understandable to a norwegian. However the verbal language is very different and it takes a fair amount of practice to understand. Norwegians usually have a much harder time with swedish, since there are a large number of words that are completely different, where danish would be very similar, if different at all. Norwegian may have an easier construction for verbs than Dutch, but have you ever looked at Afrikaans? Now that's what I call easy. It may be easy to learn how to write and read Norwegian, but if you go to different citys you may see that almost no one speaks Bokmål. I'm from Fredrikstad and many people dont understand what I say, because of dialects. "Jæ tællær på vollæne med gummipælær på bena og tællekællen i øra!" "Øy! Erru oppænte? Din gamle kæll!" As someone who has lived in both Holland and Sweden I must say I found Dutch the easier...Maybe Norwegian is easier than Swedish somehow though. Perhaps the Danish influence means its pronounced more naturally. Great article, but i have to agree with many others that the dialects within norwegian borders have not been given enough attention. I am a canadian citizen with Dutch parents and I have spoken dutch and english interchangably since I was born. I have also lived in Norway for a number of years as a teenager (I am now 19). I can confidently say I speak all 3 of these languages fluently and on a native level. I agree that Norwegian is easier than Dutch in terms of pronunciation, verb forms and to some degree vocabulary. You have also perfectly described the relationship between the scandinavian languages. Even though there are some significant dialect differences in Holland, they pale in comparison to Norwegian. The dialects in Norway do add to the languages appeal in my opinion, but do discourange and frustrate a lot of foreigners. The fact that the dialects are extrememly different in pronuncation demands that someone really has to master the language to understand every norwegian. Take a walk down karl johans gate in olso and listen to the melting pot of dialects in the capital city. If someone only uses olso dialect as a template to learn norwegian, they are going to encounter a lot of problems as soon as they travel 10 kilometers out of the city. Really interesting article about my language! The word "verd", claimed to be wrong by "NorwegeanGirl", actually exists, it's the Nynorsk-version of the word "verden" ("world"). About Norwegean grammatical genders: You say that "Norwegian has two genders. Technically it has three, but the male and female are grouped into the 'common' gender". It's true that 'common' gender can be used in Bokmål, but it's rather 'conservative' language. The dialect of Bergen, however, is characterized by its use of the common gender. It's not regarded to be conservative in this area of the country. Someone mentioned "-The i/på confusion. These propositions are very irregular in usage and create a great deal of confusion". Actually, I think there is a "rule" here, or perhaps I've made it up myself. (I do think we learned this in school) Eather way: "i" is used for cities, and locations along the coastline (also in the Fjord-areas - "i" happen to rhime with "sea", so this should be easy to remember). For locations 'in country', "på" is used (if the location isn't a city, of course). Mor vil ikke at Ingrid selger sykkelen sin. (Mother doesn't want) that Ingrid sells her bike. (Okay, maybe the english in that example is not entirely sound or beautiful (I'm Dutch), but you get the idea). I have the idea that Norwegian keeps following a Subject-Verb order where English en Dutch start inverting. i.e. That Norwegian looks more like English because English inverts less than Dutch. Furthermore, where Norwegian does invert (S-V-->V-S), both English and Dutch do so as well, and generally in the same way. I really feel like learning Norwegian now! This was very helpful and I can't thank you enough. Very interesting although not too surprising given the perfect English spoken by Norwegians and Scandinavians generally. However i think i, and most people, would find it a bit of a challenge to get motivated to learn the language given that (certainly in my experience of the country) everyone in Norway speaks at least competent English regardless of age, profession, social status etc etc. I think it's fast approaching the point where only genuine enthusiasts will learn the language if they already speak English as there will be no actual need to speak it - much like the situation with Welsh/Irish/Scottish Gaelic in the British Isles - when all native speakers also speak excellent English. Ah, but don't forget that with Norway you also have the second highest GDP per capita in the world. I think it's a mistake to look at the total GDP of a language, as per capita is much more in line with individual interests. A language with a small population and high GDP per capita in an independent country = high paying jobs for those that can find them, and fluency in the language can help there. Ahhh! Can anybody who speaks Norwegian help me translate this 1 minute quick interview into English please?? I speak Irish (Gaeilge), English and Dutch as a native speaker and I have found these the perfect mix for learning Norwegian. Part of the reason that Irish is useful is because the Vikings who invaded Ireland and were mainly from Norway, not Denmark. Examples would be the word "bra" (brea in irish) and the phrase "Hvordan du deh", of which the "du deh" part survives in the northern Irish dialect. Another example is the words for cry which in Irish are "caoineadh" and "gol" and in Norwegian are "grine" and a similar word for "gol" which I have only heard spoken and do not know how to spell. I would argue that some sounds are difficult for English speakers, such as y, æ, ø and å, where afrikaans vowels are more regular. Also the reluctance to pronounce the t and d at the end of syllables can be confusing. While Norwegian is easy to learn on paper, I would argue that the pronounciation and litling would be difficult for many English speakers to learn and understand. I have heard from my Norwegian friends that Dutch speakers tend to learn the language more quickly that any other nationality but perhaps this also has to do with the fact that many native Dutch speakers speak both Dutch and English, whereas many native English speakers do not. For litling, please read lilting, by which I mean the intonation and stress on certain syllables. u just use one case to imply all. actually the word order in norwegian can be very different from english. Great article with which I agree wholeheartedly. I am a native English-speaker who lived in Belgium and went to school in the Netherlands for a few years when I was a teenager and kept up with the language, even studying it at the university here in the United States. I developed an interest in Swedish due to having relatives with Swedish ancestry and took two years of it also at the university level and have studied it on an off in the many years since then. My opinion, but I think word order, grammar and sentence structure are HUGE issues to overcome when learning any language - I am generally good with pronunciation in any language I try to speak after I practice awhile. I have in recent months been tinkering with larning/understanding/reading Danish and Norwegian as well due to their similarities to each other and Swedish. I can confirm (from my experience, at least) that Swedish is MUCH easier to learn for an English-speaker than Dutch due to a more similar grammar and much more similar sentence structure, and commonalities like the possessive "s" - and in addition English has cognates that it shares with the Scandinavian languages that it does not share with Dutch (tree, take, of, from, again, etc). I agree with the Dutch poster that English and Dutch do share a more similar sound system, but Norwegian does seem to have a simpler set of sounds than either Swedish or Danish, which would render it easier. Scandinavian languages should be tremendously easy (aside from maybe some challenges in acquiring good pronunciation skills) for someone with a background in English and either German or Dutch. Very interesting article. I love dabbling in German and Scandinavian languages. Knowing German helped me tremendously when learning Swedish. Even high-school Latin won't help me learn any of the Romance languages; I've tried, but they don't interest me. Thank you, I shall concentrate a bit more on Norwegian now and see where that leads me. I am the person who posted on 11/20/09. I think a knowledge of German or Dutch paired with English is ideal for learning a Scandinavian language. To be sure, the Scan. languages share much more of the complex vocabulary with Dutch or especially German than they do English, since English has borrowed from French more than anything in that regard, but the common words most of us use in English in everyday speech are overwhelmingly Germanic. The flow of English is more like that of Swedish, Danish or Norwegian than it is Dutch, which is much more like German from that standpoint than English. While English may share much of its vocabulary, especially compound words with French, try carrying on basic speech without a solid knowledge of basic French grammar or vocabulary.....I guarantee that for most people it will flow more naturally in a related Germanic language and especially one with a structure similar to English. Vocabulary similarities will only take you so far and won't necessarily help the flow of everyday speech, especially when the the similarities of English to the Romance languges are largely with more complex language. I live in an area of the US with a large Spanish-speaking population, and, while like French there ar many words similar to those in English, the simple expressions are not, nor is the grammar with all of its cases and conjugations even in the same ballpark. While often one can make out the meaning of many Spanish sentences from the context of the cognates, actually constructing one in speech or understanding simple language is another story. I really enjoyed this post and all the comments everyone has contributed! I agree with those of you who talked about the difficulty of pronunciation. I have big problems with the "kj" and "sj" sound, just always comes out like a spluttering "sh" like in English. I suppose it doesnt matter too much until you get to minimal pairs and where the change in sound can mean you are saying something compleeeetely different. But, you know what? I know I am never ever going to sound like a native speaker. It is, frankly, rather impossible. But, why should I want to? Having my English accent is a part of me and my identity (could go into a whooole other discussion on identity, so I will stop here) and I am not going to hide it. Besides, by learning Norwegian and speaking it with natives is showing enough respect towards their country, culture and identity, why would a perfect accent increase that? As for grammar, I agree that it is rather straightforward in its structure. Having learnt Spanish and French it is quite nice NOT to have to conjugate verbs according to person! I actually quite like the whole putting the definite article at the end of the noun. It is quirky and unlike the languages I have learnt. The one main difficulty for me grammar-wise is the conditionals. Like, in English we say "I wouldnt go if I were you" but (lovely, cute, wonderful, darling Norwegians) say "I wouldnt gone if I were you". If I am wrong in that, slap me. Maybe that will help me learn it even after all these months! I suppose I have also grown to love Norwegian because I get to practise it with someone I care about deeply. When your heart is involved it kinda makes everything look rosy, even conditionals. This is a good article, but I have to say Esperanto is easier to learn than Norwegian, and probably a better introduction to languages more generally. You would get a lot further in Esperanto. I found myself able to converse fairly fluently about anything by 6 months. I doubt you'd get that in Norwegian, unless maybe you moved there. I think Esperanto is a good language for people wishing to learn none in particular, as it's a less stressful, more fruitful hobby project. The other thing is, it's easier to make a simple language your second language, and later pick up harder ones. Maybe Norwegian is good for this also, and certainly I don't want to discourage people from learning Norwegian, but Esperanto is better for that. >But, you know what? I know I am never ever going to sound like a native speaker. It is, frankly, rather impossible. But, why should I want to? Definitely agree with you on that. Far too many define fluency as speaking with no accent whatsoever when understandable accents are more charming than anything. Even Schwarzenegger works at not losing his accent. He just wouldn't be the same if he sounded like just some dude fro Michigan or wherever else. >This is a good article, but I have to say Esperanto is easier to learn than Norwegian, and probably a better introduction to languages more generally. Check the post again - it says right in the beginning that it excludes constructed languages and pidgins/creoles. Im a native norwegian from Bergen. Ive never made a distinction between those sound, its not in my dialect. I believe also the distinction is on its way to disappear from the language as younger norwegians tends to use the skj- sound for all. And the skj- sound in norwegian is exactly the same as the sh- sound in english. Like in sharpe. This is not a good thing. You are ruining it for the rest of us. French is the easiest language for the Brits. Once about a 100 basic french words are learned and then some quite easy rules are applied, you only need to pronounce the rest of the english words with a french accent to speak an understandable french. More than half of the French words are stolen from the English. I have to disagree. First of all, I grew up speaking english as my native tongue. I only learnt danish when I was around 12 years old, so I feel I can speak about this somewhat objectively. Now, what I agree with completely is that written danish and norwegian are pretty much near identical and should be pretty natural to read the other language without much difficulty at all. However, I disagree that spoken norwegian should be easier than spoken danish. I don't feel like you spent much time discussing just how different the vocal tones are between norwegian and english. English is a pretty flat language, whereas norwegian is quite colorful and fluid and involves a number of quick tongue twisters in every day language. Danish, on the other hand, is more like English in being calm, flat and it is easier to distinguish when going from one word to the next. Once an english speaker gets over pronouncing D's ( like how D in gade is more like L ) and wrap their head around how danish strings words together to form new long words ( speciallægepraksisplanlægningsstabiliseringsperiode *breathes* ) and all the rest, I still think it's easier than understanding spoken norwegian. To relate to another language, Thai is quick a simple language to learn. The language itself is not very complex, but to master spoken thai is really quick difficult because you have to discover and learn to use a whole new set of facial muscles. As a South African, I have the advantage of speaking both English and Afrikaans, and it is the Afrikaans that makes travelling in Germany and the Scandinavian countries really easy. I am currently working on Swedish Web site projects and finding it quite surprising at just how easy it is to figure out the Swedish. An Afrikaans speaker above mentioned that Afrikaans is a really descriptive language, and even though English is my home language, I would have to agree with that. While a relatively simple language to learn (especially if you have any other Germanic language in the locker), it is a wonderfully expressive language. Many English speakers in SA will use Afrikaans to really express themselves! It has the power. are not pronounced the same! ø: much like "u" in "turn"
Is Norwegian really easy? The Russian language professor Valerij Pavlovitsj Berkov says in an interview in the Norwegian newspaper Aftenposten (31 June 2009) that Norwegian is one of the world’s most difficult languages to learn to speak perfectly, because of the toneme (the two distinct pitch patterns). Let me give an example: The Norwegian word “sinnet” in one toneme means “the anger”, whereas the same written word in the other toneme means “the soul”. Norwegian nouns are inflected in singular and plural and indefinite and definite forms (indefinite singular, definite singular, indefinite plural, definite plural). English inflects its nouns in singular and plural only. Adding -(e)r is correct for Norwegian plural in many cases, but only if it is the indefinite plural form of masculine or feminine nouns. The indefinite plural of “sykkel” (bike) is “sykler” (bikes), so in addition to adding “-er” you have to get rid of a “k” and an “e” as well. The definite plural form has other (quite regular) endings, normally “-(e)ne”. However, the definite plural form of the indefinite singular “museum” (museum) is “museene” (the museums”). If you just skip the feminine forms, you will sound quite odd (unless you are 96 years old, or from Bergen, but they sound odd anyway). In English, the adjective does not change. In Norwegian, the adjective “gammel” (old) is “gammel”, “gammelt” or “gamle” depending on the gender and definiteness of the noun it belongs to. The worst example here is the adjective “liten” (little), which has the following forms: liten (indefinite singular masculine), lita (indefinite singular feminine), lite (indefinite singular neutrum), lille (definite singular), små (plural definite and indefinite). And you can’t just make a passive by adding an “s” to the infinitive! In some cases you can, but not in past tense, for example. would you recomend learning norweign and then german? So you know the similar words and its easier or would it be best just to jump to german language? Only if you're more interested in Norwegian in the beginning. Languages take too long to learn IMO (except constructed languages of course) to use them solely as bridges to other languages. But if you're equally interested in Norway and won't be going to either country in the near future, then certainly start with Norwegian and only move to German after you've become fluent. Regarding the comments from "anonymous" above: I think that any language that has significant variations from standard phonology (i.e. the pure sounds one might find in standard Spanish or Italian) will be difficult to master, and that includes English. I read the article in the link provided. I could also argue that I have NEVER heard a non-English speaking person master an (American) English accent perfectly with no trace of giving himself away as a foreigner. I have met several who have come fairly close and most are speakers of either Dutch or one of the Scandinavian languages, but no one in my experience has mastered it - either some stilting of speech comes through, vowels are just slightly off, or a grammatical error/misuse is made of a type that would not be typical of a native speaker. I think all of the dipthongs and variations of vowels and consonants which are voiced to different degrees all make it extremely difficult for a non-native speaker to master, for example the way Americans pronounce the "t" at the end of words. I HAVE seen Britons/Aussies who could perfectly emulate an American accent but not non-native speakers. I am quite sure any of the Scandinavian languages would be next to impossible to speak with a perfect native accent for similar reasons. Norwegian however is not really "tonal" in the same sense as say Vietnamese is; different stress timings on words affecting meaning can be found in many languages including Dutch and English. "According to my Norwegian grammar-book, på can also be used for small towns, especially the more inland ones. There are some more general rules like this, but most also have their confusing exceptions.."
As a quick and dirty way of distinguishing between when to use "i" or "på" (with the exception of towns etc), think "in" or "on". "På et bord" = "on a table", "på en sykkel" = "on a bike". "I bilen" = "in the car", "i dusjen" = "in the shower". And of course, it might vary with the dialect. For example: I'm from Oslo, and would say "han kastet steinen gjennom vinduet" ("he threw the ball through the window"). My boyfriend is from Telemark, and there it's perfectly OK to say "han kastet steinen mellom vinduet" (literally "he threw the ball between the window"). My oh my, what a well researched and interesting article! And you write so beautifully! As a native of Norway who has lived in Canada for many years (and like you, in Calgary for some of that time), I can relate to a lot of what you say. I do agree with some of the other posters with respect to Norway's many dialects, but at least in a Scandinavian context, I don't think Norway is different from Sweden or Denmark; they also have a rich variety of dialects. I don't know how it compares to other countries/languages though. Flott gjort! Du er usedvanlig dyktig! Thanks a lot for a very good and interesting article. Being a Norwegian, I found it fascinating to be able to "see" my own language through the eyes of someone with English as his native language. From hearing English people (trying to) speak Norwegian, my impression is that word order is the biggest (or at least to a Norwegian - most notable) obstacle. This inversion of "ikke" and its associated verb in complement clauses is one of the greatest pitfalls for non-scandinavian foreigners in general and anglophones in particular. Many of them never seem to master it. Again we have an inversion, this time in the main clause when the subordinate clause precedes it, but not when the subordinate clause follows the main clause. The sentence "Da vi kom frem, huset sto i brann" is a dead giveaway that the speaker is not a native Norwegian. To make it easy for yourself, use common gender throughout (use only "en" and "et" for English "a", don't bother with "ei"). That way, your language sounds more conservative, which (in my opinion) is a good thing. Conversely, end all common-gender nouns with -en in the singular definite form. There are a few words which actually require -a (except in Bergen), but you can learn them as the final touch; Norwegians will be forgiving. Try to learn the neuter gender nouns by heart, since they are by far the fewest, and default to common gender for the others. Also, remember that the Norwegian language was for many years a battlefield where conservative, radical and Nynorsk agents were fiercely fighting each other. Much of the battle has now died down, so the Norwegian language now looks like a deserted battlefield, with smoking vehicles, death and destruction everywhere, in the form of two or more alternative spellings and pronounciations permitted for about half the vocabulary. As a rule of thumb, you should prefer the alternatives containing the most "e"s and the least "a"s.
Cool article, helped me prove to someone how easy Norwegian is. I am Norwegian myself. 'Snikskytter' is 'sniper' while 'snikmorder' is 'assasin'. A very interesting article and very well reserched. It's very nice to see so many people being interested in learning Norwegian. It's very interesting, given the fact that we speak a rather small language. Best of luck to those who go for it! That being said, I would like to point out some misconceptions. First of all, the Norwegian letter "å" is not at all pronounced like "aaw", since the "aw" sound is more of an open "a" than an "å". Getting this wrong is an instant give away. I'd say it's more like the sound of the vowel in "small". It is very important to actually listen to the sounds in stead of reading a substitute from your own language, as this often is very unprecise. Calling Norwegian an "easy language" depends on what your goal is with the language. As I read in a very interesting comment earlier in this thread, perfect fluency is next to impossible. To this day I've never met a foreigner speaking Norwegian perfectly, not even those who have stayed here for 20 years or more. There is always something giving them up. Regarding word order, it is true that English and Norwegian have a quite similar word order when it comes to simple sentences; however when you have more complex sentences the word order can change quite drastically! This is very important if you want to speak Norwegian well. And only one such mistake will definitely give you away (not that "giving yourself away is something to be dreaded (it will happen anyway), but I am assuming people are interested in commanding the language as well as possible if they decide to learn it). I agree that it is definitely the language to learn if you also want to understand swedish and danish, as it is located between these two languages, similar to danish in written form and similar to swedish orally. Nonetheless, as already mentioned, the huge variety of dialects might pose a problem to the language learner. I am sorry if my comment was a bit negative, that was not at all my intention, I just wanted to point the finger at some misconceptions which are convenient to put away before learning the language :) I think it is great when people decide to learn Norwegian, and I wish them all the best in their efforts. Lykke til og stå på! Thanks for posting a very interesting and informed article. I am a native English speaker from the south of England (standard English speaker!!) and am now planning to learn Norwegian. I would agree with others who have commented that Frisian is recognised as being the nearest relative of English, and certainly worthy of discussion. Some Dutch is instantly intelligible to us. Also, as a native English speaker, I find French incredibly easy. Whilst French belongs to a different language group, over 20% of English vocabulary is of French/Latin derivation. It should not be ruled out as being an easy language for an English speaker to learn simply because it is not a Germanic language. Also, as others have pointed out, English is spoken throughout the UK, not just in England. such a practical appraoch to learning a new language! thanks for writing this. I'm Norwegian and for the last hour I've been reading this article and comments with great interest. It's really interesting to read about how non-Norwegian people look upon our language, different opinions and so on. First of all... Danish spoken language is Norwegian with a full mouth of potatoes. Norwegians pronounce the words as they are written while the Danes speak the same words with some kind of gut-sound. For a forreigner it has to be much easier to understand Norwegian in that regard. One can compare this with English as the queen speaks (Norwegian) and some kind of heavy up-North English (Geordy?) when it comes to the sounds. Many mention all the dialects in Norway and that these are difficult to understand. Of course they are, just the same as in England. How many British people speak the queens English? I speak/read/write pretty fluent English, but when I pick up an English newspaper, I have trouble understanding it all. The articles are written in some other form of English, it's like they are using slang words I can't understand (and lots of them bt the way). This is something you won't experience in Norway. The written bokmål language is the same all over the place. And regarding the native tounge, most Scavdinavians also have the scandinavian accent while speaking English, so there should be no worries having a forreign accent while speaking Norwegian. The accent will not be perfect until you have spoken tje language for many years. Scandinavians can usually also hear if another person is Norwegian, Swedish or Danish while he or she speaks English (due to the accent and tone). And the last thing... Norwegians have since the late 60's been watching Swedish TV. Allmost every household in Norway has had Swedish TV channels in the house, and this is one of the main reasons why Norwegians can understand the Swedes so well. We know almost every Swedish word that is different from Norwegian, and therefore we have no problems at all understanding them. Problem for us is that the Swedish people haven't had or haven't been interested in Norwegian TV-channels (except maybe the Swedes living close to the border). So the Swedes in general don't understand the different words in Norwegian. Interesting article as it encapsulates four of the languages I learned to speak and I had come to some of the same conclusions. A native English speaker, I had some German at secondary school, then many years later learned to speak Dutch fluently and have now moved to Norway. During our Norwegian lessons (given in Dutch!) I was relieved to find that Norwegian verbs and grammer were rather more familiar than I'd expected. I never did get my head round German cases nor the piling up four or five verbs at the end of a Dutch or German sentence. I haven't read all the comments so maybe this has already been mentioned: there are also quite a few links to Norwegian nouns in English dialects, particularly Northern English and Scottish English. This can make learning Norwegian nouns easier if you already know the English dialect word. Swedish people tend to come to Norway to work but they almost never learn the language, though they tend to learn some word over time if they get norwegians as boy-/girl-/friends. Norwegians tend to make their norwegian more swedish and in a way does the same thing that Scandinavians does to foreign speakers: switching to english (here swedish). Because of the inferior status our language has and the knowledge we have of the others language (exept if you do not speak english that is). Whilst danish people tend to soften up their speech when talking to norwegians, slowing down and pronouncing clearly, so I think they're more adapt to make themselves understood for us than we for them. While swedish and danish does not compute...at all! Either they can't understand each others dialects or just unwilling to do so, because of the underligning power struggle. Very good article. But so its said.... it's impossible for foreign people to speak fluent norwegian. speaking is waaaaay harder to learn compared to easy languages like english and spanish. Norwegian got over 200dialects that is more different than english accents. Norwegian and swedish are the few european languages that is tonal(which is a language where the tone in a syllable of two otherwise identical words can change their meaning). You also breath in when you speak norwegian. For example the words ja and nei (yes, no) is pronounced while breathing in. This is just a few things that should be mentioned. But then again Norwegian is very easy to understand and read for english speakers. Wow. What a great article. I’m a native English speaker and taught myself Dutch. It felt like meeting a long-lost cousin, Dutch has opened my eyes to the other Germanic languages, and I had been wondering what language to choose next. I’m sold on Norwegian. The many warnings above about dialect variation in spoken Norwegian are helpful, but I’m happy to just acquire a reading knowledge, especially if that will also give me entrée to Danish literature, too. Dutch has almost no case markers, like English. My heart sank a little when I saw that Norwegian not only has gender, but has three (compared to only two in Dutch). I notice some comments from British posters above arguing for French. I imagine French occupies the same space for English-speaking Britons that Spanish occupies for English-speaking Americans: Those cognates! That geographical proximity! To each his own, but I’ve served my time in Romance and for me nothing compares with the coziness of Dutch. I’m sure Norwegian will feel the same. Many of you point out that when travelling to Norway it may at times not be that easy to actually learn it from the native Norwegian people because they switch over to English. I say from personal experince that when I switch over to English while talking to someone who doesn't get the language completely, and doesn't know how to pronounce all the words right, it's because it's not that easy to understand what foreigners say, when they try to talk Norwegian. Most people don't get how wrong(and weird) it actually sounds to a person who has Norwegian as mother tongue. Thats at least why I switch languages because I understand better when the other person speaks English too(if the person knows English). And then there is the fact that Norwegian isn't that easy to learn because of the different dialects. I have lived in Norway my whole life, and I sometimes have problems understanding... say for example the dialect in Bergen(Bergensernes dialekt).
" French is the easiest language for the Brits. Once about a 100 basic french words are learned and then some quite easy rules are applied, you only need to pronounce the rest of the english words with a french accent to speak an understandable french. More than half of the French words are stolen from the English." How irritably misinformed you are! Do take the time to consult an ethymological dictionary and - lo and behold - you will discover that a good 2/3 of English words come from old/middle/modern French, through Latin or what have you. Not the reverse ! And the use of the word "steal" is quite inappropriate and vaguely insulting: all languages in the world are the result of borrowings from one another.Another sizeable number of English words shares with French common Latin/Greek or other foreign roots and that should make French, at first sight at least, indeed an "easy" language to learn for English speakers. It's not: the grammar is quite a challenge, even to us native speakers, so is spelling. I shall not talk of the inability for too many English speakers to master our infamous "u" and a few other diphtongs. Beyond that, my compliments to the blogger and its followers: I just discovered your page and found it fascinating. I am always learning a new language, in fact several simultaneously,and I have always thought that I should acquire at least one scandinavian one. Your blog will have been the trigger, thank you. This is a fantastic article, incredibly helpful. I quite agree - it's amazing how many times you look at a word and think, "hang on, that looks/sounds just like...!" ... Well, since it's so easey to learn; I would like to hear you speak it! It's actually chosen to be the one of the most difficult language to learn. And not only that, it's proven that if you haven't learned it from childhood, you'll most likely never learn it properly. I think you missed some hard stuff to pick up in Norwegian. We got over 28 difrent dialect's. So if you learn one type of dialect you may have a hard time understanding a person North that have a very difrent dialect then the people south. Great artikel :-). Confirms my experience. One tip with spoken Norwegian: don't get your skjede mixed up with your kjede! Great article! I found it very interesting. In reference to the dialects, in Norwegian the word "I; Jeg" is differently used geographically as several people already have pointed out. Hope this doesn`t scare you off from the idea of learning the language. I think many of the posts here are based on bias or possibly confused. Yes French and the other romance languages are easy for some to learn due to transparent vocabulary. Certain Germanic languages are easy to learn based on grammar. It's comparable to learning how to use a computer do you use windows, mac, or linux? The dialect argument doesn't really mean much to an English speaker if you think about it. dialects are a regional variety of language distinguished by features of vocab, grammar, and pronunciation. That means there are approximately thirty-four dialects of English not including pigeon's such as Hawaiian-English. So going off the comments of many about the dialects. In English I should be able to take a cockney dialect speaker and drop them in Mississippi they will be just fine with their ability to communicate. Probably not going to work out that well. There are resources that have language difficulties rated. I think form the descriptions here the romance languages and some Germanic languages fall in the same category. So we don't need to act like sports fans that are upset our team isn't the best in someone else's eyes. theres a HUGE difference between the norwegian dialects compared to the english ones. Ok.. first of all.. i am a norwegian.. second, i have a master deg. in the nordic languages. WHAT planet did you fall from? Before you start a blogg or anything like that Make sure you know what you are talking about. just as a ex. there is about 10% of the norwegians who speak anything close to "bokmål" ..but close to 70% that would write "bokmål"
Funny how about 5 mill of the 4,2 mill people here would speak it then.. don't you think? great article.. can relate to what your writing.. as someone wrote earlier danish is very flat like english .. think danes have an easier time speaking english without any accent.. suedes and norwegians as just as good but i think their accent is more revealing! nevertheless i don't think native english speakers have an easier time with danish just because danish is flat too .. it is rather hard to pronounce and its not pronounced the way its written.. read in an article that danish is one of the languages with the most vocal sounds - sligthly over 20 whereas english end german have around 14 vocal sounds and spanish have 5.. it makes it harder to know how the words are pronuonced.. danish children know very few words compared to other children in other european countries at the same age due to their struggling with the danish pronunciation, its hard to seperate the words as it sounds like the danes are speaking without any pauses... they cath up later of course.. but this illustrates the difficulties with the danish language ! There is, of course, a great difference between having a grasp of a language and speaking it fluently. However, the morning chorus would be quiet if only the best songbirds were allowed to sing. I am a Norwegian who has returned to Norway after many years of living in the US. In this time, I met many Norwegians who professed to speak "fluent" English, but who spoke intermediate English at best and relied on the grammatical similarities between the two languages to make themselves understood. when I first moved abroad. I hope my countrymen will show the same patience to this trying their best to speak Norwegian. thesis writing service have to make your paper fast. Words are to be very clear to understand it.